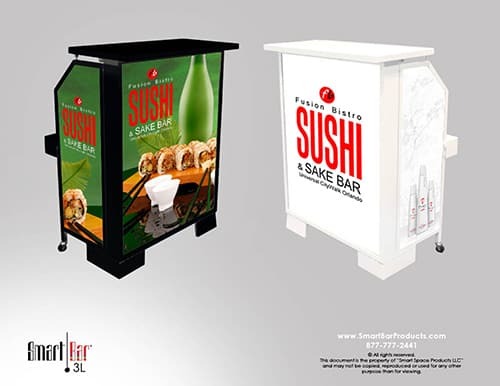 Customization, Personalization, Branding… It’s easy! 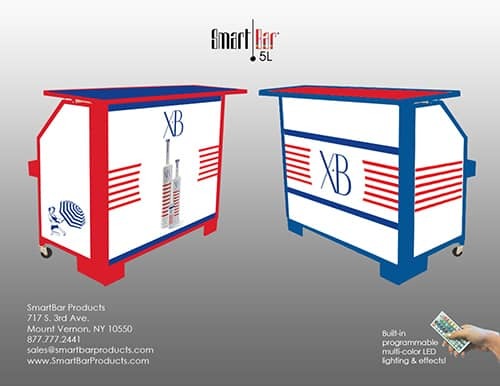 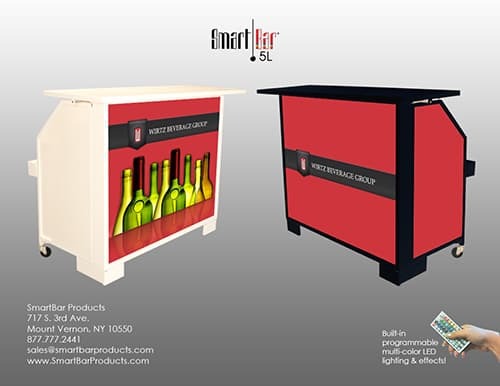 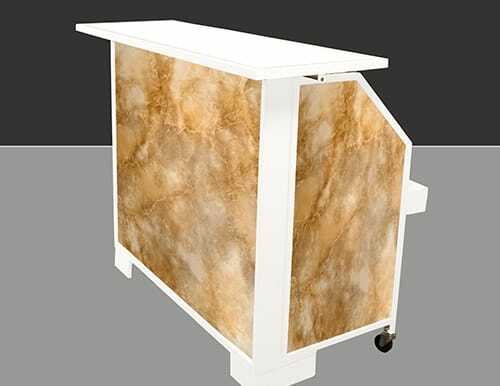 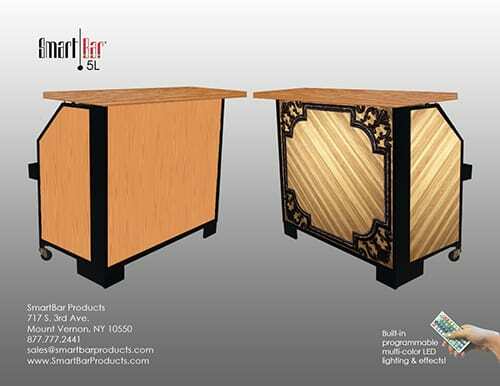 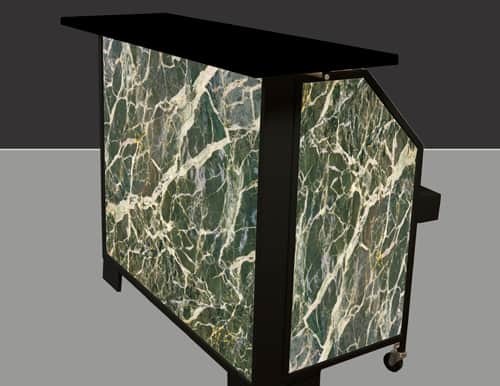 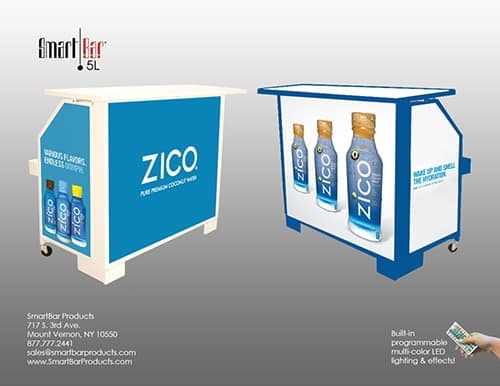 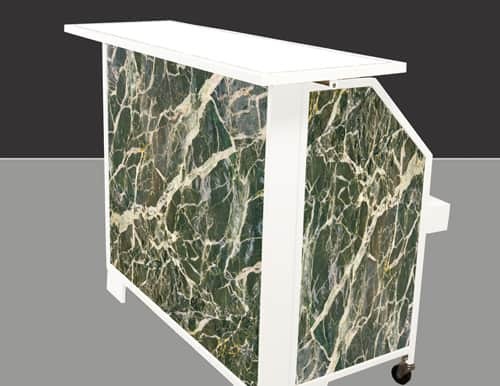 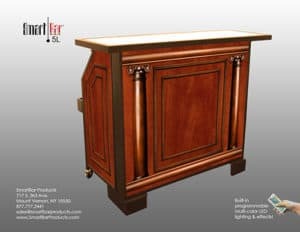 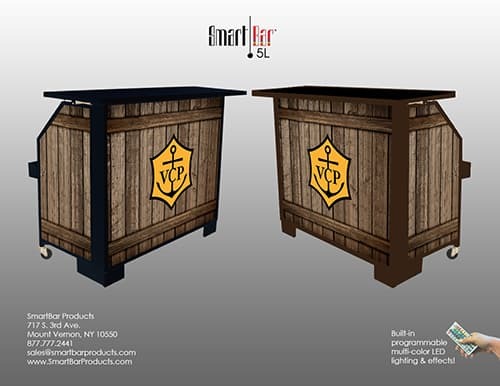 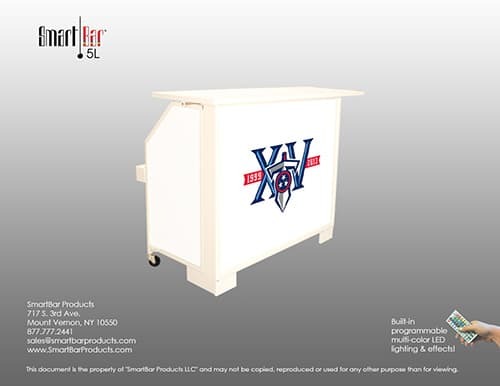 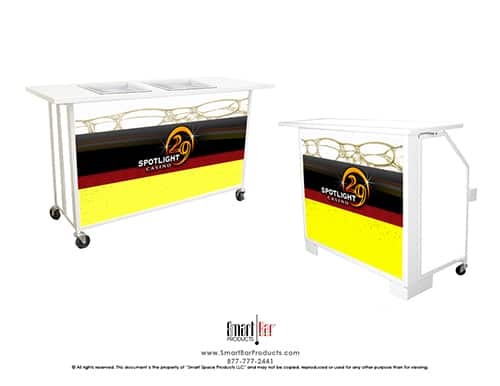 Take a look at our design & render process to get an idea of how you can customize your SmartBar Product with our Build-Your-Bar option. 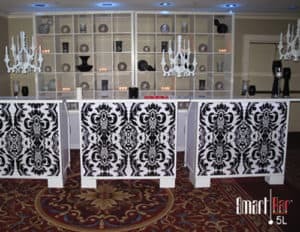 Use elements or pattern detail to match and compliment your décor. 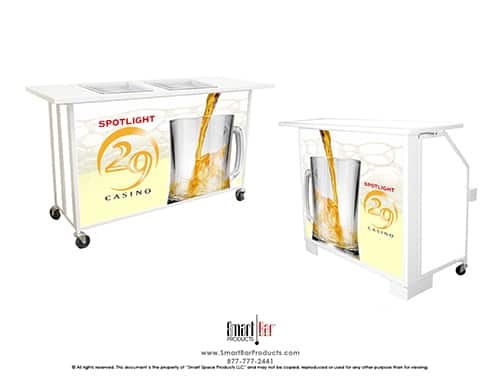 Brand the panels with logos and images to showcase products and event designs. 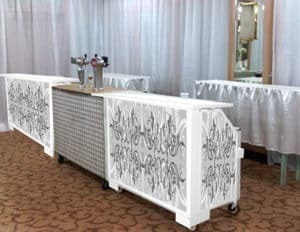 Choose white or black bar frame color (custom colors available upon request). 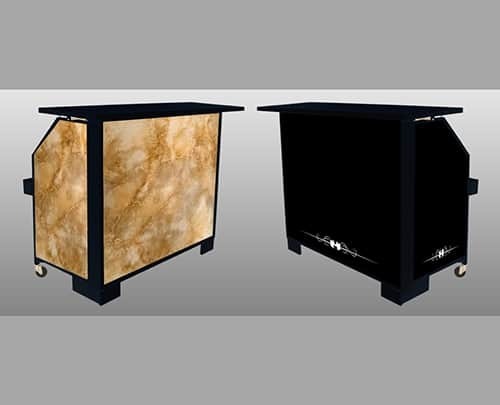 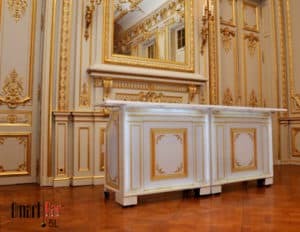 Choose white or black Top Counters (white is standard, black is custom). 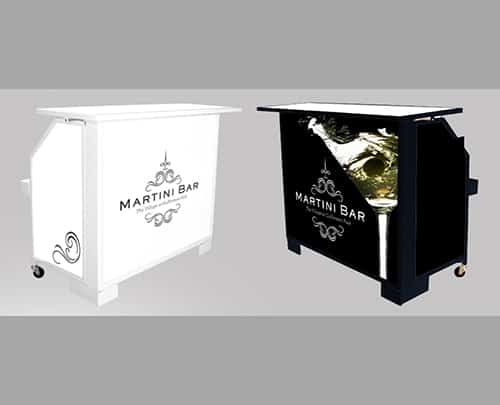 Upload your logo or any other image you’d like to see placed virtually on the panel(s) – within 24 hours we’ll email you back with a render of your designed bar. 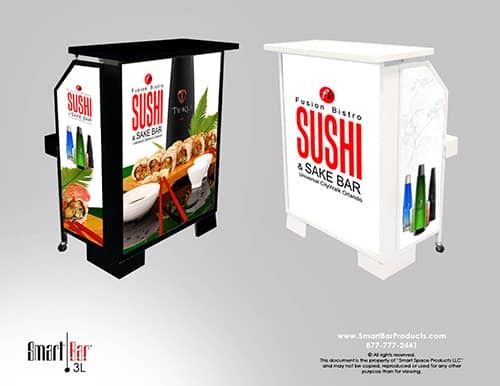 Once you realize your vision is on its way to creation we’ll revise and design according to your needs. 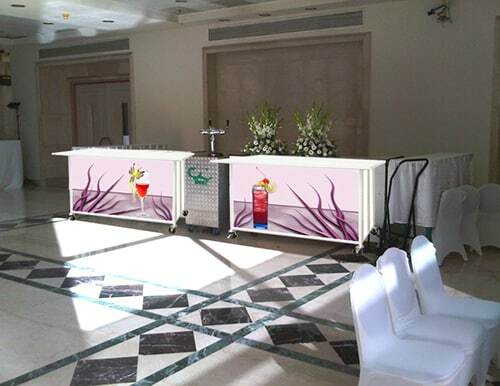 We provide the full gamut of bar design to suit any environment or occasion. 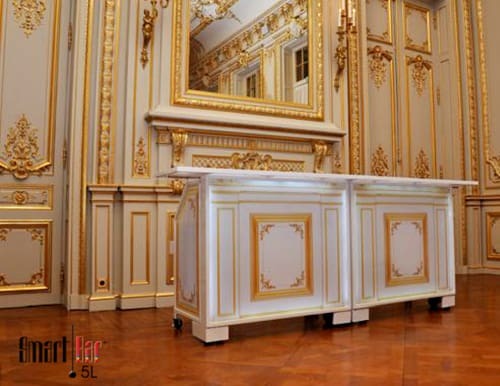 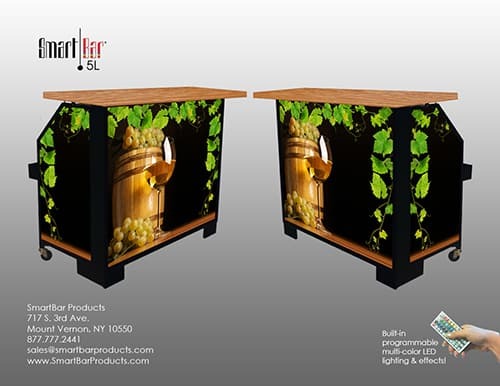 For immediate assistance with your specific needs, you can email or call Shelly directly to go over details and design specifics at shelly@smartbarproducts.com or 877-777-2441 Ext.4. 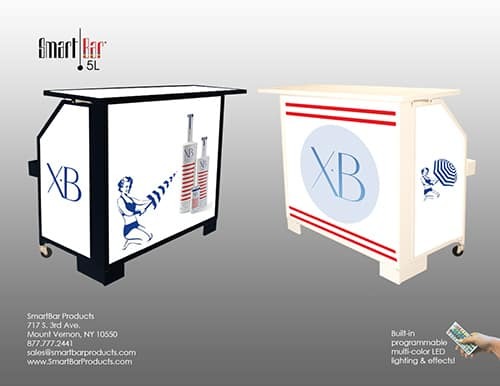 Upload Your Logo Or Design(s). 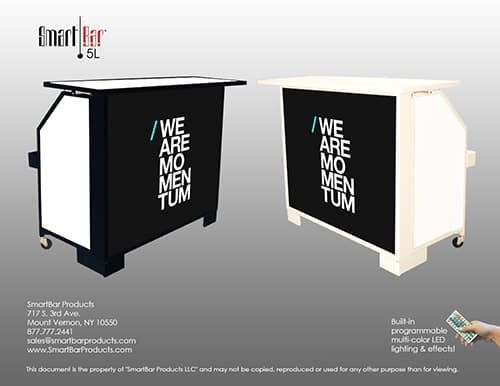 Upload the logo or image file you’d like to start with through our upload form. 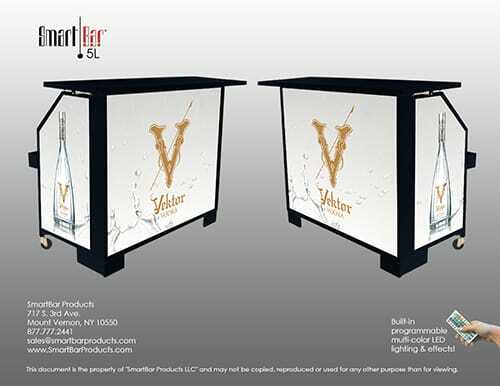 Give a brief description of how you want to see it displayed on the front panel (& sides if you choose a fully designed bar). 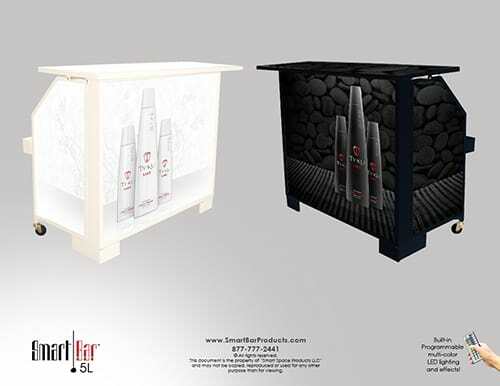 Once received we’ll respond by email with a render or print approval form. 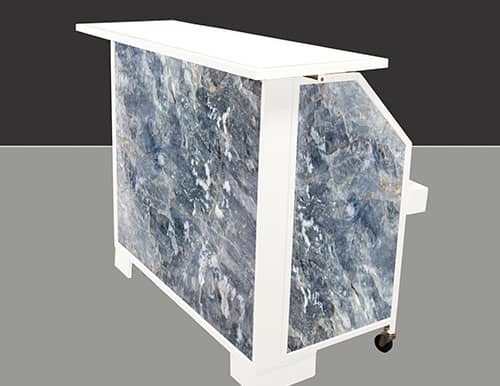 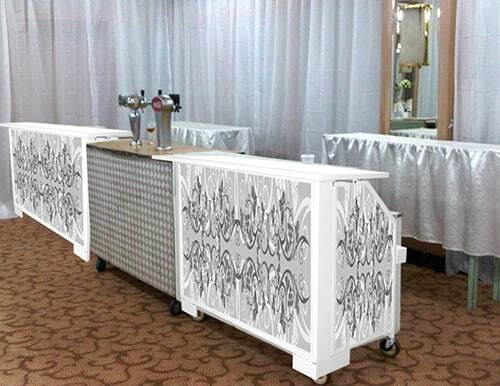 Currently, we do not offer side prints for Bar in a Box or BackBar PLUS only the SmartBar 5L. 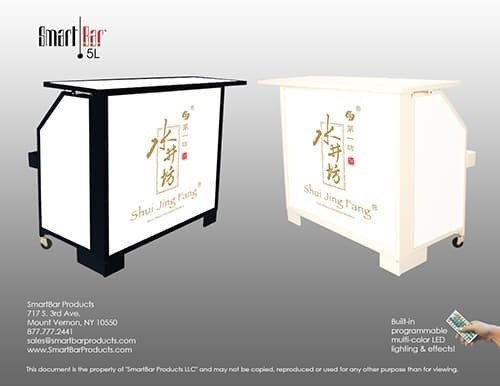 We will send you an email to confirm receipt of your file and request the shipping address for the formal estimate. The final print approval form for your order will be sent by email for your approval. 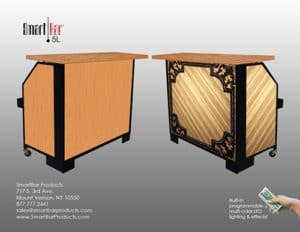 If no errors are found, simply reply with the signed print approval form that the proof is approved. 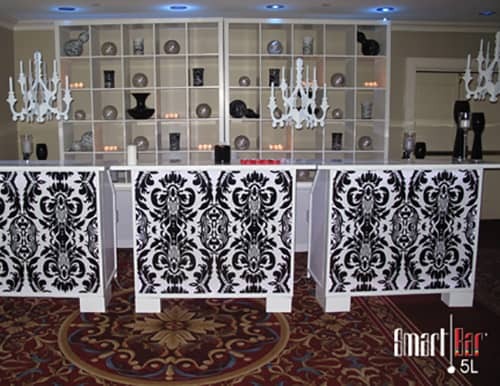 If you require changes we will accommodate immediately and revise at no extra charge. 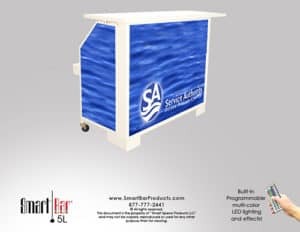 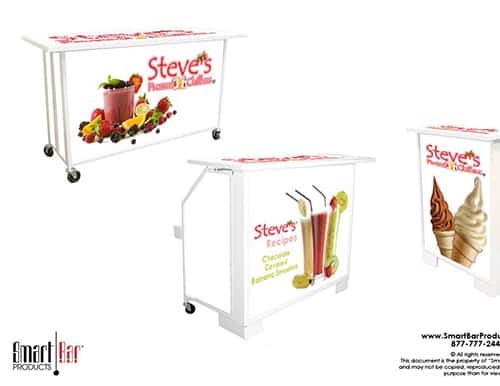 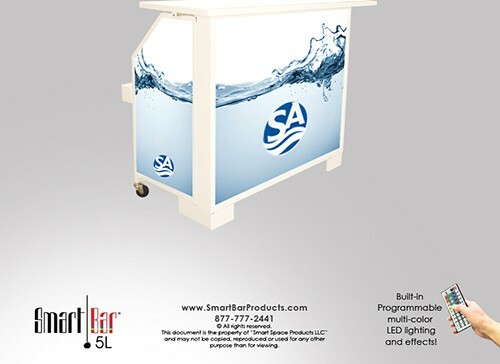 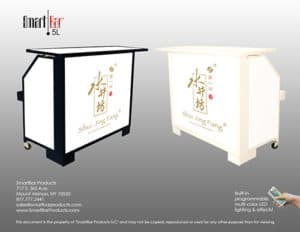 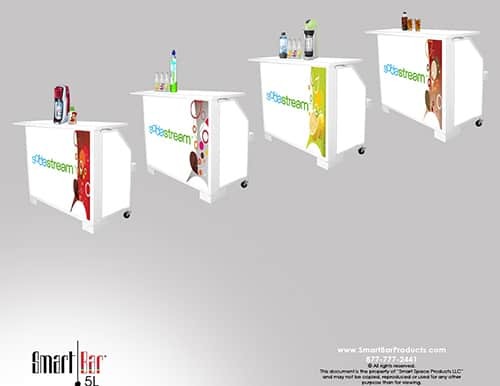 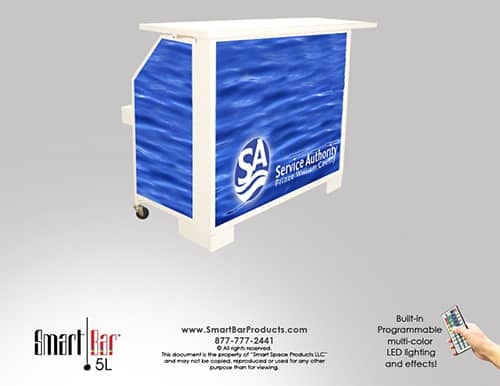 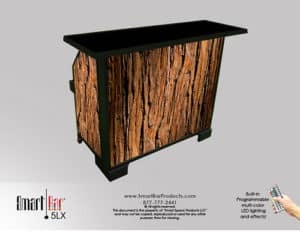 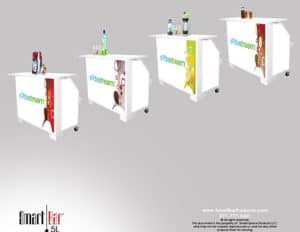 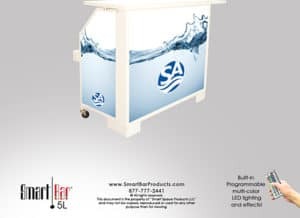 If you’re purchasing your first SmartBar 5L, Bar in a Box or BackBar PLUS along with the removable printed graphics panel(s) the estimate will be for the bar(s), print(s) and design fee. 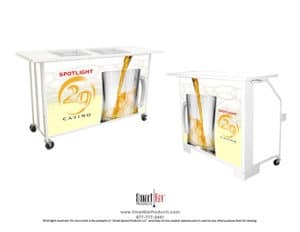 Our design/art file set up fee is a one-time charge per order of $50.00 (for more complex needs we don’t go above $75.00 we like to keep your customization experience enjoyable!) 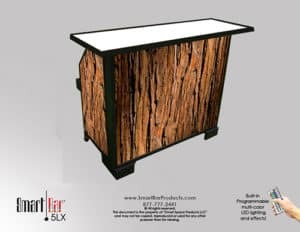 Bar in a Box logo placement only is $25.00. If you’re a returning customer and only need the removable printed graphics panel for your existing bar we generally go to production and ship within 1-2 days after approval.